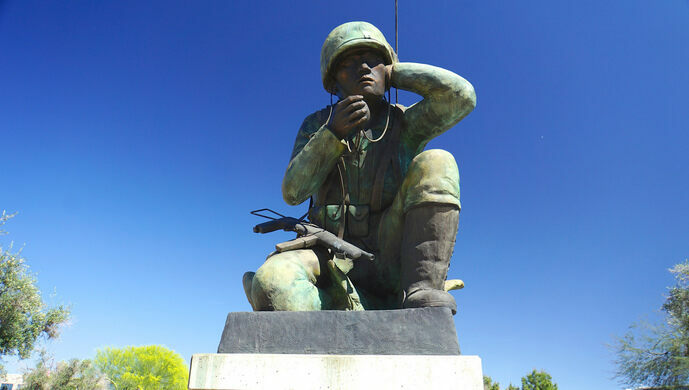 The secret communications work of the Marine Corps during World War II was declassified in 1968, but it wasn’t until 1989 that the first memorial was dedicated to the encryption specialists now famously known as the Navajo Code Talkers. 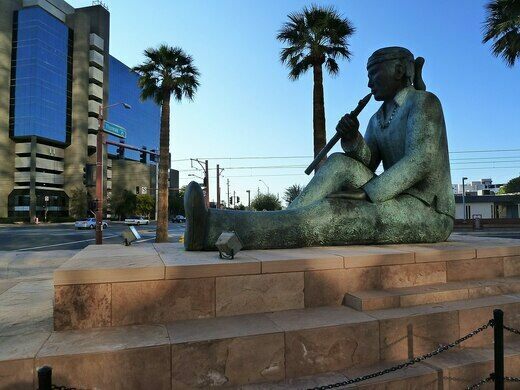 The enormous sculpture is prominently positioned at the corner of Central Avenue and Thomas Road in midtown Phoenix, and sculptor Doug Hyde chose to represent a Code Talker in traditional attire carrying a traditional communications device: a flute. Serving in the Pacific in every major battle of the war, the Code Talkers used their notoriously difficult language as the basis for a code that was never broken. But Navajo was neither the first nor the only Native American language to be used by the U.S. military for wartime communications. Cherokee, Comanche, and Choctaw tribal members were deployed in World War I and, together with Seminole, Assiniboine, and others, they continued to work throughout World War II. More Native Americans have served in the U.S. military per capita than any other ethnic group, and their efforts were central to success in combat. Hyde, whose own heritage is Nez Perce, Assiniboine, and Chippewa, is a veteran himself of the Vietnam War. 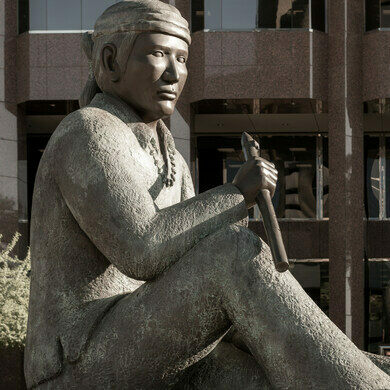 A master in stone as well as bronze, he has pieces in major museums throughout the United States, including at the Smithsonian’s National Museum of the American Indian. And while his memorial is distinctly Navajo, Hyde’s intention was to include symbols that would be understood by all Native American tribes. 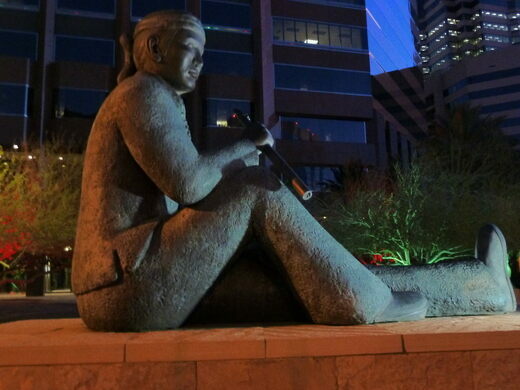 The Phoenix memorial imparts the spirit of the Navajo Code Talkers by depicting a young boy with a flute, representing the communication of peace rather than war. 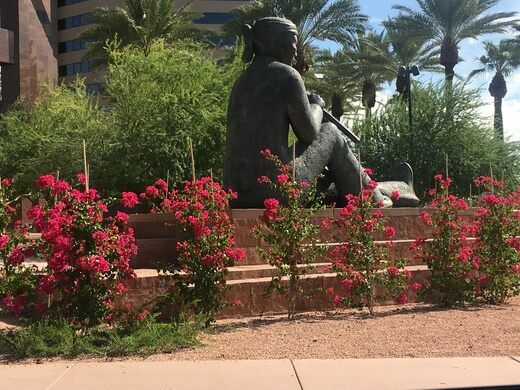 The absence of military garb and the emblematic radios emphasizes that the new generation of Native peoples will live in peace as a result of the sacrifices of the Code Talkers. 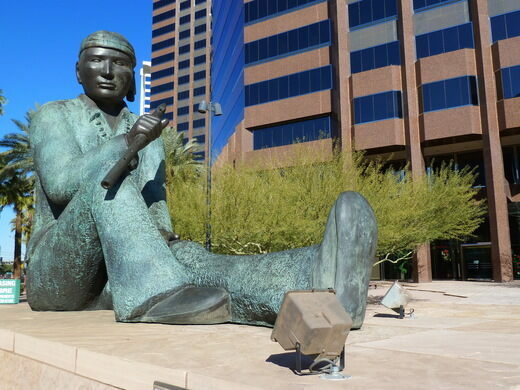 It is believed that fewer than 10 of the 400 Code Talkers who served in the 1940s are still alive today. 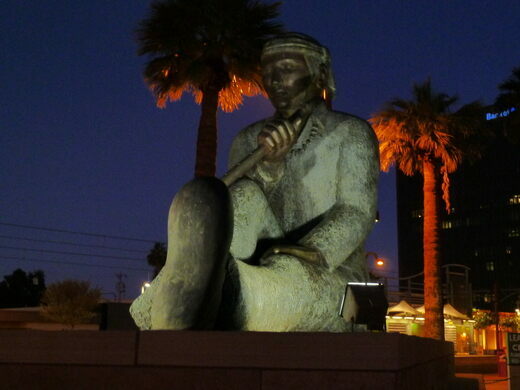 A short distance away from the Thomas Road memorial, on Wesley Bolin Plaza near the Arizona Capitol, is another more recent monument to the Navajo Code Talkers that employs a historical military theme. Open since 1938, this diner has kept its fountain, malt machine, and all the gum that greasers left beneath its counter.